Under the direction of Matt DiCarlo, the play premiered this week at the Emerson Colonial Theatre where it will be performed through November 18. Co-Written by Henry Lewis, Jonathan Sayer, and Henry Shields for the Mischief Theatre company, the play made its original debut in London before moving to Broadway in 2017. The play has since toured six continents and received several awards including a Tony Award for Best Set Design and the 2015 Olivier Award for Best New Comedy. It has even extended its current Broadway run into 2019 after 27 previews and over 745 performances. The play is a performance of a melodramatic murder mystery called “The Murder at Haversham Manor.” It is performed by actors from the “The Cornley University Drama Society” who don the roles of mock actors in the play. Perfectly planned, everything that could go possibly wrong during the production does. Actors forget their lines, words are mispronounced, set pieces fall apart, props are misplaced, and the soundboard operator, who would much rather be on his phone, misses cues and presses the wrong buttons. While the scenarios remain simple slip-ups at times, the problems of the show soon reach dangerous levels. After all, the set includes a platform that raises ten feet off the ground with no railing and is held by one support beam. The set of the play itself is detailed because everything is an intended hazard. Every slip, gag and gimmick is precisely choreographed, with set pieces rigged exactly. Some props were in the wrong location before the curtain rises, notably some flammable ones. The irony of the show is that it takes a lot of attention to detail to make a mock-show look negligent and why the hilarity of this show holds up. You would also normally expect actors to know the show by heart by the time it opens, yet they jump pages and it gets to a point where the murder mystery’s twist is spoiled by the actor’s mishaps. 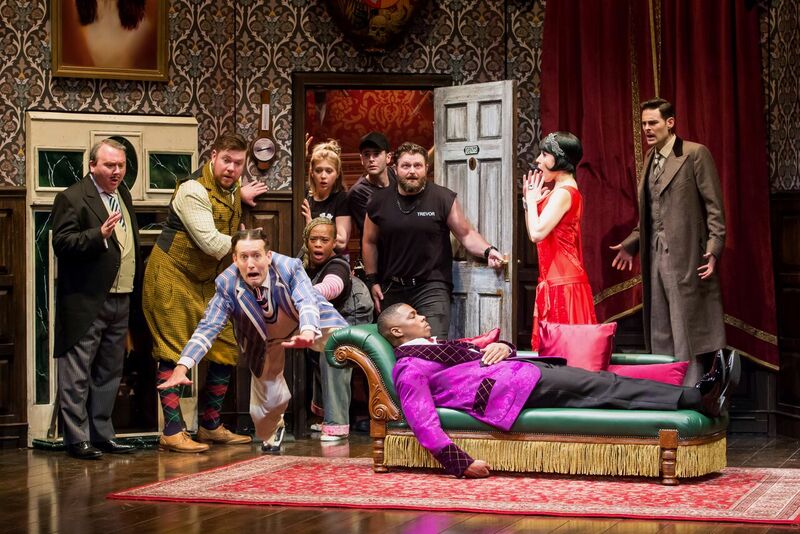 Audiences are guaranteed to laugh out loud at “The Play That Goes Wrong” because of the clever writing and absurdity, as well as just how much care and detail went into the set and staging of the actors. This play will leave viewers tears after the audience witnesses the true power of theatre in all of its glory and chaos. For more details regarding the show, visit www.BroadwayInBoston.com.